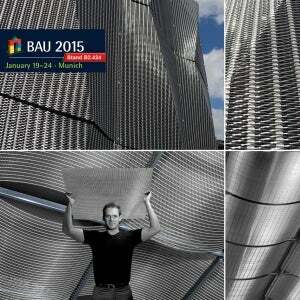 HAVER & BOECKER will be presenting several new architectural mesh developments at BAU 2015, the world’s leading trade fair for architecture, materials and systems, in Munich, Germany from 19 to 24 January 2015. One Innovation is a 3D façade system made of stainless-steel mesh. The high-quality, 3D mesh façade by HAVER & BOECKER is a dynamic-looking mesh cladding for projects with individual character. The second new product by HAVER & BOECKER is the new SUSPENSE ceiling system. Very different shapes can be realised with this curved system and straight ceiling forms. The new suspended ceiling system made of metal mesh allows large-scalable and individual ceiling designs. Furthermore, HAVER & BOECKER will be displaying new types of architectural wire mesh at BAU 2015, which open up new design opportunities with exciting structures and special characteristics. In addition to current product innovations, HAVER & BOECKER will be exhibiting numerous proven solutions at BAU. A large element of the transparent IMAGIC WEAVE® media façade and numerous samples of different architectural wire meshes in stainless-steel, as well as in fascinating colours.